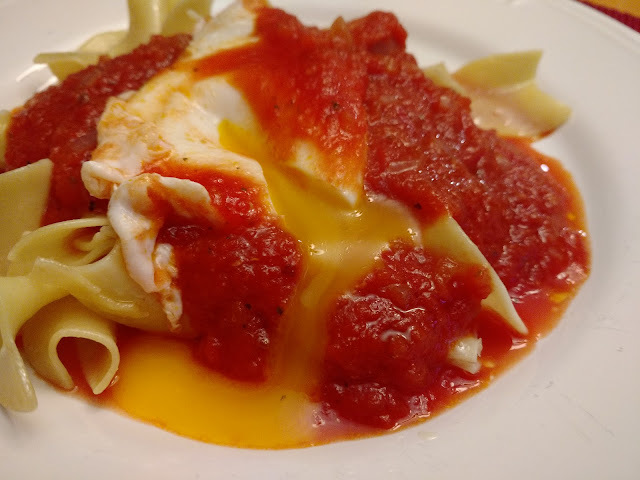 Eggs in Purgatory has been my go to recipe since I do not even know when. It's fast. It's inexpensive. I always have the ingredients in the house. It is a versatile dish. But it needed an update. I do most of the cooking on the weekends. 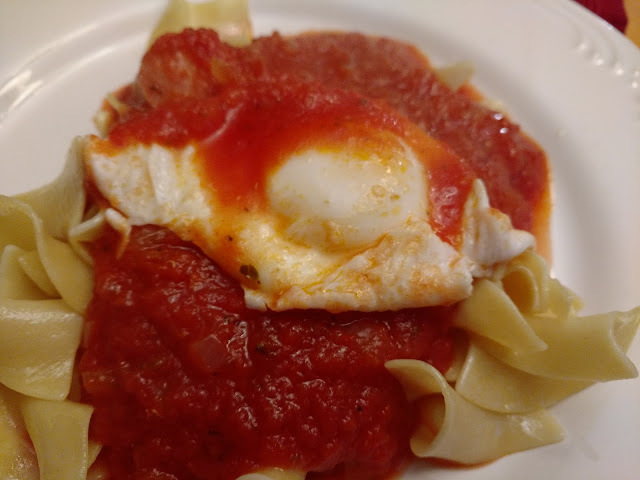 Recently I have been mastering the art of the poached egg. I have finally found the method that works best for me. I fill a skillet with water and add a 1/8 tsp of vinegar (I use cider or white wine, which ever bottle is in the front of the cabinet). Bring that to a boil. Crack open the eggs and put each of them in small bowls. When the water comes to a boil I start to pour the egg into the water but I hold the bowl in the water as if pouring it but let the egg sit for moment while it starts to firm up and then pour the egg from the bowl into the water. That's it for the eggs. I poached them when I got home tonight. The sauce was made this weekend. It was a simple Marinara sauce. I added some sliced hot dogs so it would not be a meatless meal. The eggs actually oozed out over the sauce. It was so rich and so simple. We served the sauce and eggs over buttered egg noodles. Loved it!